It’s time for another upcycle on Altered State of Mine – it’s been a while. And this one? SO easy you could do it in your sleep. But I wouldn’t, because it involves sharp scissors. Play it safe, peeps! Today, I’m talking boot noodles. And this isn’t a new recipe. Trust me. And yes, this is the time of year I need to talk about this. So, I’m a boot wearer. Not hiking boots, though those have their function. But a fashion boot loving girl! 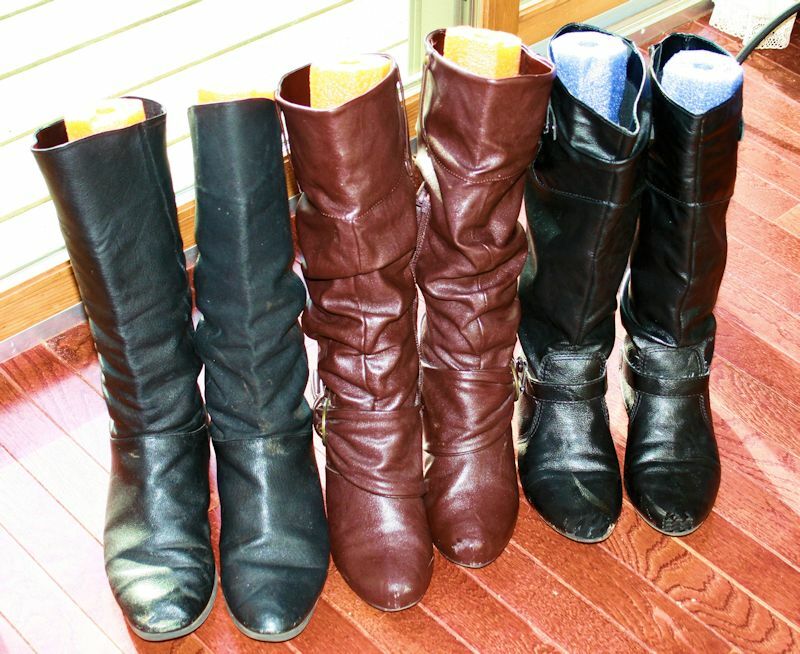 And…it’s almost boot season!! Yay! However, my boots were suffering from a chronic illness – slouchy boot syndrome. Yes, it’s true. 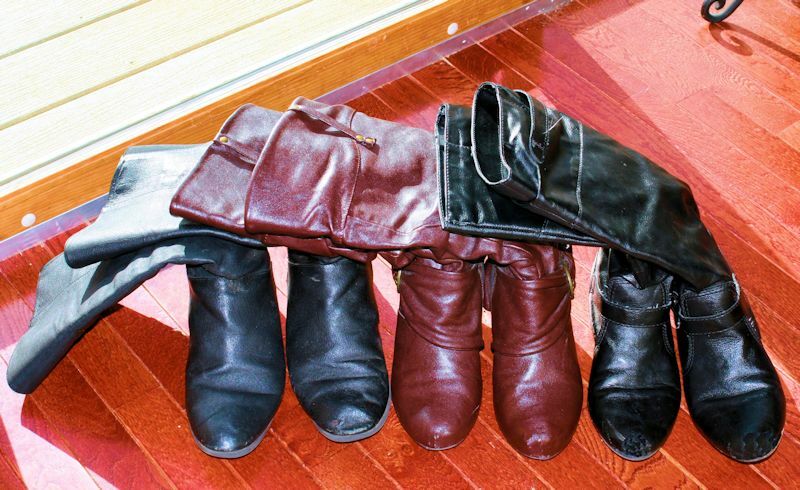 Every time I took off my favorite fall/winter accessory, they’d slump sadly to the floor. And risk getting scuffed. And not sit nicely in my closet. And just be…untidy. Well clearly, I couldn’t have that! 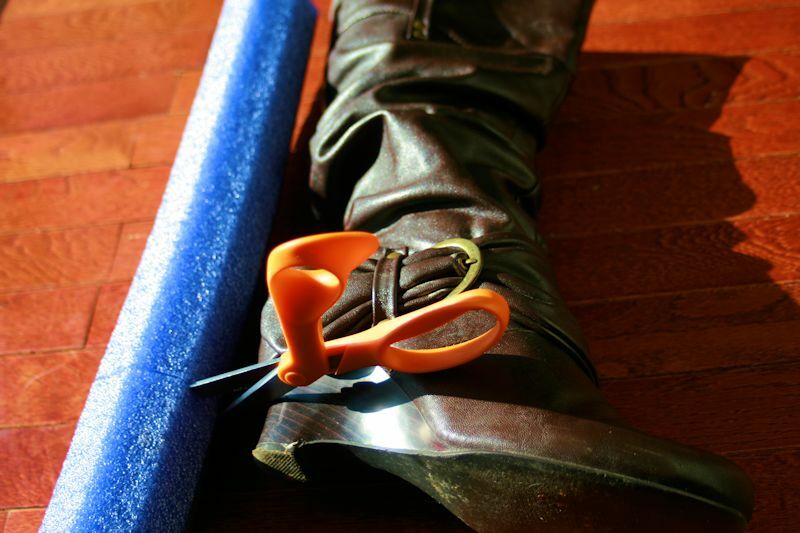 Necessity being the mother of…well, everything, I knew I had to figure out a better way to store my boots. Those things are expensive, ya know! My mom had just unearthed a couple of pool noodles from her storage for my youngest to play with. (Quick review – we live in the mountains. With NO pool. Just keeping it real, people.) 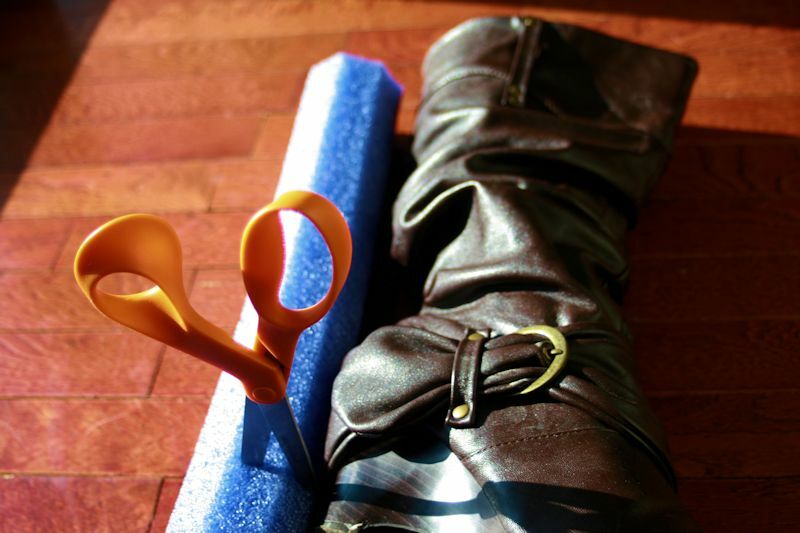 After the girl lost interest – with no water, it didn’t take long – I had pool noodles floating around my house. 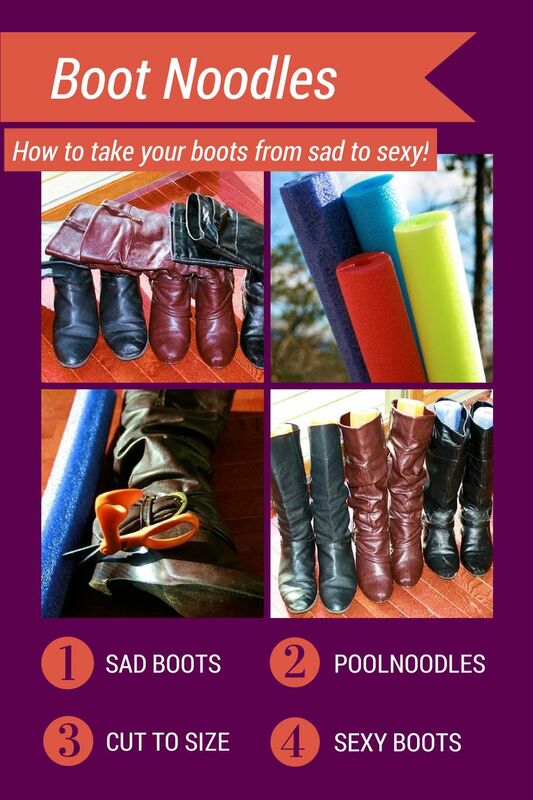 Enter…boot noodles! All I did was measure the length needed (I don’t really measure – I held it up to my boot and eyeballed it), then cut the noodles to length. They’re super easy to cut – use a craft knife, a box cutter or a pair of scissors. Then just place them in the boot’s legs. Done. From slouchy boots to fine, upstanding members of the boot community in just minutes! And why am I sharing this astonishing trick with you now? In August? Clearance sales, baby! 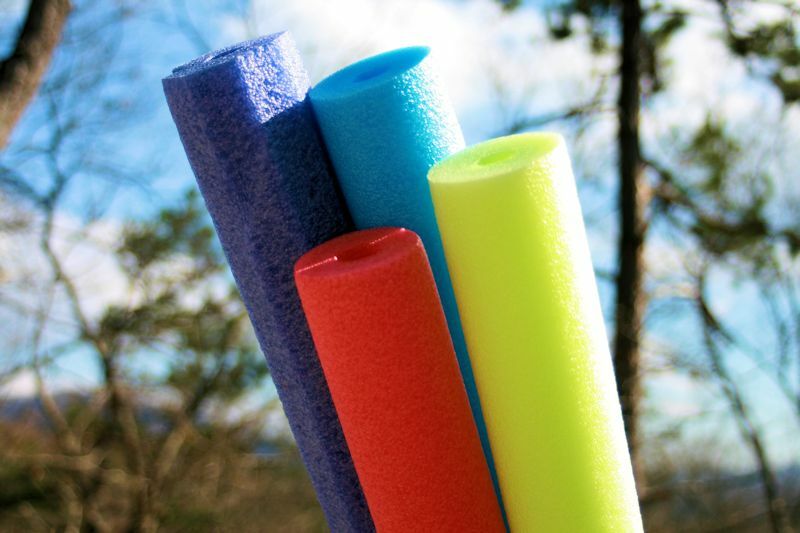 Because while pool noodles are pretty cheap to start with, finding them on clearance makes this upcycle just that much sweeter.